For current news, see the Exoplanet Archive News page. For previous years' news, see the 2017, 2016, 2015, 2013, and 2011-12 news archives. 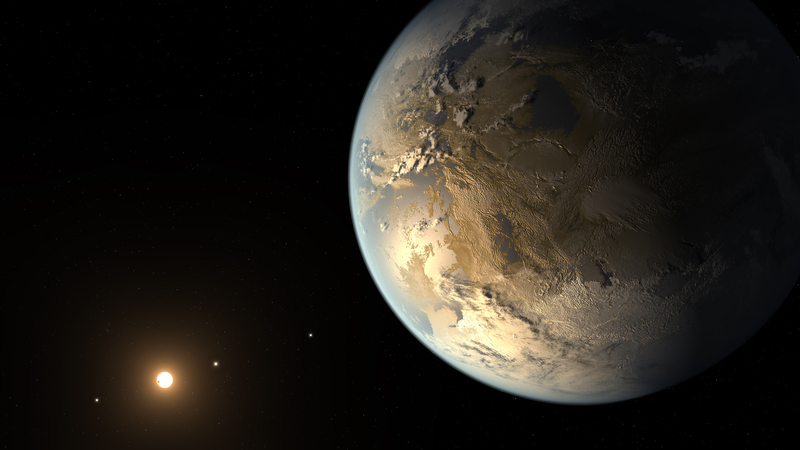 December 22, 2014: The K2 mission has its first planet! Welcome to HIP 116454 b to our Confirmed Planets table. See the NASA press release for details, and the archive's Overview page for this object. December 18, 2014: Kepler has closed the Q1-Q16 KOI table; see the Purpose of KOI activity table for details. The archive has also updated several stellar and planet parameters. December 16, 2014: The Q1-Q16 table for Kepler Objects of Interest (KOI) has updated false-positive dispositions for eight KOIs. See the Purpose of KOI activity table, the KOI Cumulative and Q1-Q16 interactive tables and the KOI column definitions. More confirmed planets added this week! Welcome HD 5319 c, HD 10442 b, HD 75784 b, Kepler-432 b, GJ 3293 b and c, and GJ 3341 b. See the Confirmed Planets interactive table for their data. Also, parameters for seven HD planetary systems have been updated: HD 33564 b, HD 41004A b, HD 41004B b, HD 4113 b, HD 5319 b, HD 4308 b, and HD 43197 b. Please note we are using the name and parameter for GJ 3293 c from the two-planet Keplerian fit in Table 3 of the Astudillo-Defru paper (2014arXiv1411.7048A). It is listed as "planet d" in the three-planet Keplerian fit in Table 4 of the same paper. Multiple Transit Search Supported The Transit and Ephemeris Service now supports list upload to generate transit predictions for multiple targets, and the service also produces a results log for each query. Six added planets: We welcome Kepler-289 d, Kepler-430 b, Kepler-430 c, Kepler-431 b, Kepler-431 c and Kepler-431 d to the fold. Note that Kepler-289 d is published as PH3 c. View them all in the Confirmed Planets interactive table. UPDATED KOI PARAMETERS! The Kepler Project has delivered updates to the Q1-Q12 KOI data, including new candidates. For more information, see the Purpose of KOI activity table, the KOI Cumulative and Q1-Q12 interactive tables and the KOI column definitions. Kepler TCERT Reports: The PDF files used by the Threshold-Crossing Event Review Team (TCERT) to vet TCEs are now available for objects in the TCE and KOI interactive tables. These files contain diagnostic plots and data for all TCEs, and include diagnostics produced by DV, as well as additional ones calculated outside of the Kepler pipeline. See the instructions for accessing these data products. IRSA Finder Charts: The archive now includes copies of finder charts normally generated by the Infrared Science Archive (IRSA). See the instructions for accessing these data products. Radial Velocity Curves: We've added 155 new RV data files with help fom J. Wright's group, bringing our stellar count with RV data files to 485. The RV curves can be downloaded from an object's Overview page. See the instructions for accessing these data products. Our new Transmission Spectroscopy interactive table is a new type of data we're hosting: published atmosphere characterization data for a subset of transiting confirmed planets. Documentation includes descriptions of the data columns. Our new K2 Targets Table covers campaigns 0, 1 and 2, and includes cross-matched 2MASS designations. As with all of our interactive tables, the parameters can be searched and filtered, and exported to our plotting tool or a text file. The table can also be accessed through the application programming interface (API); documentation includes descriptions of the data columns. The new Mission Stars interactive table is a compilation of stellar properties for stars on the observation lists for upcoming Exoplanet Explorer Program (ExEP) missions, which includes WFIRST/AFTA, the Exo-S and Exo-C probe studies, and LBTI. The table can also be accessed through the application programming interface (API); documentation includes descriptions of the data columns. Now Available: Histograms of Archive Data We've expanded our plotting tool to provide histograms of archive data. To access the tool, click the Confirmed Planets Plotting Tool button on the home page, or from the Plot Table menu option from any interactive table. The Transit and Ephemeris Service now supports list upload to generate transit predictions for multiple targets, and the service also produces a results log for each query..
November 6, 2014: We've put together two movies with our pre-generated plots for use in presentations. One illustrates the progress of Kepler discoveries over time; the other shows the number of exoplanet discoveries in mass-period space over a 25-year period. Find them on the pre-generated plots page. October 30, 2014: This week we've added TYC 1422-614-1 b, TYC 1422-614-1 c, WASP-28 b and OGLE-2008-BLG-092L, as well as updated stellar and planetary parameters for various planetary systems. View them all in the Confirmed Planets interactive table. MORE Updated KOI Dispositions! The Kepler project has delivered false positive flags and updated dispositions for 44 KOIs in the Q1-Q12 activity table, bringing the total number of Kepler candidates and confirmed planets to 4,178 in Cumulative table. For more information, see the Purpose of KOI activity table, the KOI Cumulative and Q1-Q12 interactive tables and the KOI column definitions. Always Show Scroll Bars in Mac OS X: Starting with OS X Lion, Apple changed how scroll bars appear (and disappear) by default, making them fade away when not in active use. This can make it difficult or impossible to scroll in some interfaces, including our interactive tables. Fortunately, there is a simple solution. See our FAQ for details. October 23, 2014: The Kepler project has updated dispositions for 133 KOIs in the Q1-Q16 activity table, bringing the total number of Kepler candidates and confirmed planets to 4,183 in the Cumulative table. This delivery is also the first to include flags that denote reasons why a KOI was given a FALSE POSITIVE disposition. The four flags populated with this delivery are: Centroid Offset, Significant Secondary, Ephemeris Match Indicates Contamination and Not Transit Like. For more information, see the Purpose of KOI Activity Table, the KOI Cumulative and Q1-Q16 interactive tables, and the KOI column definitions. October 16, 2014: WASP-69 b, WASP-70 A b, and WASP-84 b have joined the family of confirmed planets. We have also updated several parameters for HAT-P-13 b, HAT-P-32 b, TrES-1 b, HD 149026 b, WASP-94 A b and WASP-94 B b, which you can view in the Confirmed Planets table. October 3, 2014: The Confirmed Planets table has an additional 16 planets ingested this week, and had HD 41248 b and c removed based on the Santos et al. (2014) paper. The 16 planets are: HIP 67851 b & c, HIP 97233 b, WASP-94 A b, WASP-94 B b, Kepler-422 b, Kepler-423 b, Kepler-424 b & c, Kepler-425 b, Kepler-426 b, Kepler-427 b, Kepler-428 b, and KIC 10001893 b, c & d (Kepler-429 b, c & d). September 25, 2014: This week we've added HD 14067 b, WASP-104 b, and WASP-106 b, as well as updated stellar and planetary parameters for various planetary systems. View them all in the Confirmed Planets interactive table. September 18, 2014: This week we welcome GJ 15 A b as a confirmed planet, as well as updated orbital parameters for GJ 667C b & c and WASP-67 b. View them all in the Confirmed Planets interactive table. We've also removed GJ 667C d, which was refuted in the Robertson and Mahadevan paper. August 28, 2014: This week we've added WASP-117 b, as well as updated stellar and planetary parameters for various planetary systems. View them all in the Confirmed Planets interactive table. What is a "default parameter?" Find out in our updated Frequently Asked Questions. August 21, 2014: One new planet, CoRoT-22 b, has been added, as well as new stellar parameters for 75 solar-type stars. Some transit and default parameters have also been updated. All of these updates can be accessed through the Confirmed Planets table. Also, the Confirmed Planets table now displays WISE photometry for 728 stars. To view, click Select Columns, expand the Photometry Columns submenu and then select the WISE columns. Or, from the planet's Overview page, expand the Photometric Measurements submenu and select the stellar photometry items. next to an object name). July 24, 2014: Two new planets have been added: Kepler-421 b and HD 150706 b, as well as new stellar and planetary parameters. Also, we've expanded our old exoplanet counts page to offer many more exoplanet and candidate statistics, and the page now includes links that return pre-filtered interactive tables. Access the page by clicking the box that says View more Planet and Candidate statistics on the home page. There is also a new help document on creating your own pre-filtering URLs. July 10, 2014: Three new planets have been added: OGLE 2013-BLG-341L B b, XO-2 S b and XO-2 S c. The XO-2 system is a case of a wide binary whose stellar components both host planets. The transiting XO-2 N b (formerly XO-2 b) was already in the archive. The new planets in the system were detected through radial velocities. Also, GJ 581 d has been removed from the archive due to recently published refutations (2014arXiv1407.1049R). See the Excluded Targets page for a list of removed and excluded targets. New and additional parameters have been added for GJ 581 b, c and e, CoRoT-7 b and c, and HD 173416 b, HD 175541 b, HD 179079 b, and HD 179949 b.
July 3, 2014: We've added one new planet this week, HATS-4 b, as well as updated parameters for four other planets: HD 170469 b, HD 17092b, HD 171028 b and HD 171238 b.
June 25, 2014: We've added four new confirmed planets: GJ 832 c, Kepler-419 b, Kepler-419 c, and Kepler-420 b. Additionally, the Kepler project has updated dispositions for 625 KOIs in the Q1-Q16 activity table. This brings the total number of Kepler candidates and confirmed planets to 4,234. For more information, see the Purpose of KOI Table document and the interactive tables. June 19, 2014: We've added 264 photometry measurements at different bands for over 100 planet host stars, including 174 new values for V (Johnson) magnitudes. View them in the Confirmed Planets interactive table. ARCHIVE TIP: When using archive tools such as the interactive tables and plotting, make sure your browser allows pop-ups for exoplanetarchive.ipac.caltech.edu. You will need to re-run your query after updating your settings. June 12, 2014: We've added four new confirmed planets: HIP 105854 b, CoRoT-24 b, CoRoT-24 c and OGLE-2008-BLG-355L b.
June 10, 2014: The Kepler project has added 19 KOIs and updated dispositions for 2,422 KOIs in the Q1–Q16 KOI activity table. This brings the total number of Kepler candidates and confirmed planets to 4,254. For more information, see the Purpose of KOI Table document and the interactive tables. June 4, 2014: Following the announcement of two super Earths orbiting the Kapteyn star, we have added the planetary data for Kapteyn b and c to the archive. Access the data in the Confirmed Planets table, read the press release, and read the Anglada-Escude et al. (2014) paper. June 2, 2014: We've updated the default stellar/planetary parameters for the Kepler-10 planetary system based on the HARPS-North mass measurement result in the Dumusque et al. 2014 paper (accepted). Read about it in the NASA press release and access Kepler-10 b and c's parameters in the Confirmed Planets interactive table. May 29, 2014: We've added 13 planets this week: Kepler-414 b, Kepler-414 c, Kepler-415 b, Kepler-415 c, Kepler-416 b, Kepler-416 c, Kepler-417 b, Kepler-417 c, Kepler-37 e, Kepler-122 f, Kepler-338 e, Kepler-418 b and GJ 687 b. We'll be at the 224th meeting of the American Astronomical Society! Stop by the NExScI booth to chat with an archive scientist and see a demo of our new data and services. We'll also be tweeting as @NASAExoArchive to #aas224 and posting on Facebook. May 22, 2014: Today marks the launch of a new service, redesigns of some services, and major enhancements to home page, which was designed to provide quick access to all of the archive's main data sets, tools, and services. The overview pages now display multiple values for the planet and stellar parameters with multiple published parameter sets in the archive. Links to tools, missions, and other archives that complement the NASA Exoplanet Archive's offerings. We will be at the summer AAS meeting in June. Stop by the NExScI/Kepler booth for a demo, or just to say hello! May 22, 2014: Improved Data Plotting: Our interactive tables now support single-click column sorting and removal, as well as and copy-and-paste of values. We've also improved the plot controls and added the ability to plot uncertainties. May 15, 2014: Six new planets: HD 285507 b, GU Psc b, HATS-5 b, bet Cnc b, mu Leo b, and bet UMi b. May 8, 2014: Four new planets added: HAT-P-44 b, HAT-P-44 c, HAT-P-45 b, and HAT-P-46 b.
April 24, 2014: This week we have added one planet, MOA-bin-1L b, and removed four planets. The four were removed because their planet masses were revised, thus exceeding our limit of 30 Jupiter masses, as defined in our Exoplanet Criteria. Those planets are: HD 16760 b, HD 190228 b, HD 43848 b and HD 5388 b.
April 17, 2014: Today the archive has 10 new planets, including Kepler-186 f, an Earth-radius planet located within the habitable zone of the host star, as featured in today's press release and the published paper. The other planets are: CoRoT-25 b, CoRoT-26 b, WASP-95 b, WASP-96 b, WASP-97 b, WASP-98 b,	WASP-99 b, WASP-100 b and WASP-101 b.
April 10, 2014: Three new planets: WASP-68 b, WASP-73 b and WASP-88 b. March 27, 2014: The recent paper by Knutson et al. (2014) reports mass constraints on tertiary companions to a large number of known transiting planets. One of these companions, WASP-8c, falls within our criteria of less than 30 Jupiter masses (Mjup), so we have added it to the Exoplanet Archive. You may now use either archive names (from the literature) or SIMBAD names when uploading lists to search the WASP or Kepler Stellar data sets. There is a new CFOP video demo! March 6, 2014: Two new planets this week: WTS-2 b (KIC 1173581) and HD 4203 c.
February 26, 2014: We've added 715 new Kepler planets from the Rowe et al. 2014 paper, as described in today's press release. With today's announcement, Kepler now accounts for 57% of all confirmed planets. Please note the default names of planets from Xie 2013 and Xie 2014 have been updated to reflect their Kepler Names to be more consistent with the published versions and the Rowe et al. paper. We've also removed 60 planets from the archive for various reasons, which are described on the Removed Targets page. February 19, 2014: We've just added additional CoRoT light curve data sets for run codes LRa05, LRa06, LRc07, LRc08, LRc09, SRa04, SRa05, and SRc03 for both the Astero-Seismology and Exoplanet Survey channels. This release includes 25 new Astero-Seismology light curves and 32,007 new Exoplanet Survey light curves. To access, click the CoRoT Astero-Seismology and Exoplanet links on the left side of our home page, or from the Data drop-down menu at the top of the page. February 13, 2014: The Kepler project has updated dispositions for 534 KOIs in the Q1-Q16 KOI activity table. This brings the total number of Kepler candidates and confirmed planets to 3,841. For more information, see the Purpose of KOI Table document and the interactive tables. February 6, 2014: One planet added this week: HAT-P-49 b. Did you know we have video demos? There are currently demos on using the Viewable Transit Service and the Community Follow-up Observing Program (CFOP), and we are in the process of creating more videos. Access the videos from the Videos page. January 30, 2014: Eight new planets added: HD 154857 c, HD 114613 b, Kepler-138 c, Kepler-138 d, Kepler-412 b, Kepler-413 b, UZ For b and UZ For c.
January 28, 2014: Kepler light curve data sets for Quarter 17 are now available in the archive. To access, click the Kepler Light Curves link on the left side of our home page, or from the Data drop-down menu at the top of the page. Additionally, all Q13 light curves are now public and also available in the archive. January 24, 2014: Four more planets have been added: KELT-6 b, NGC 2682 YBP 1194 b, NGC 2682 YBP 1514 b and NGC 2682 SAND 364 b. Also, did you know you have access to more than 21 million light curves in the Exoplanet Archive? In addition to Kepler data, we have light curves from SuperWASP, the CoRoT Exoplanet Survey and CoRoT Asteroseismology, HATNet, XO, TrES and KELT. A complete listing of the archive's data can be found on the Holdings page. January 15, 2014: Seven more planets added: MOA-2011-BLG-322L b, CoRoT-27 b, Kepler-105 b, Kepler-130 c, Kepler-411 b, WASP-103 b, and Kepler-51 d. Also, the Kepler project has added 412 new KOIs to the Q1-16 and Cumulative tables. For more details, see the documentation. January 14, 2014: In case you missed it, we started off the new year with surpassing 1,000 planets in the archive! See the full story on the Planetquest site. January 7, 2014: This week we've added 39 new Kepler planets—all from the Marcy et al. (2014) paper. This brings our planet count in the archive to 1,015! Note that KOI decimal numbers of 10 and above (e.g. KOI 244.10) are not assigned by the Kepler project and are often used by authors to denote non-transiting planets in Kepler systems with known transiting planets or candidates. For more information, see our FAQ. Also, the Kepler project has closed the KOI activity table for Q1-Q8. Therefore, no further changes will be made to that data set. For more information, see the associated paper (Burke et al 2013).